This post may have affiliate links, which means I will receive a small commission if you choose to purchase through those links (at no extra cost to you). Thank you for supporting the work I put into this site! 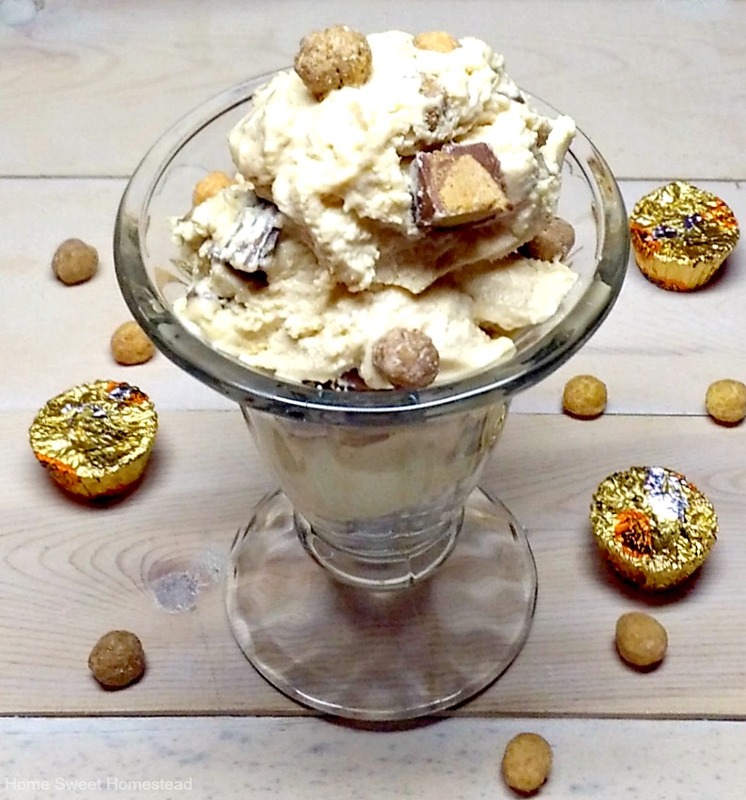 No-Churn Peanut Butter Lovers Ice Cream, is an ultra rich and creamy ice cream with loads of peanut butter flavor, and is made without an ice cream machine! This post and recipe was created for #SummerDessertWeek. I was sent samples by some of the sponsor companies, but as always opinions are 100% my own. Ice cream is one of my families favorite desserts during the summer months. Before I discovered no-churn ice cream, I used to yearn wistfully for an ice cream maker, as I served my loved ones store bought ice cream. My first adventure with no churn ice cream was this simple and delicious Vanilla Ice Cream. After my first bite I was hooked. Which of course led me to trying different flavor combos, mint chocolate chip, strawberry, chocolate cherry, and now this yummy version, Peanut Butter Lovers. No churn ice cream is amazingly easy to make, it only takes a handful of ingredients, and just a few minutes to whip up. The longest, and hardest part, is the freezing time. Peanut Butter Lovers Ice Cream combines chewy pieces of Reese's Puff Cereal, and chunks of Reese's Peanut Butter Cups, wrapped in a rich and creamy peanut butter flavored ice cream. Pure bliss in every bite. 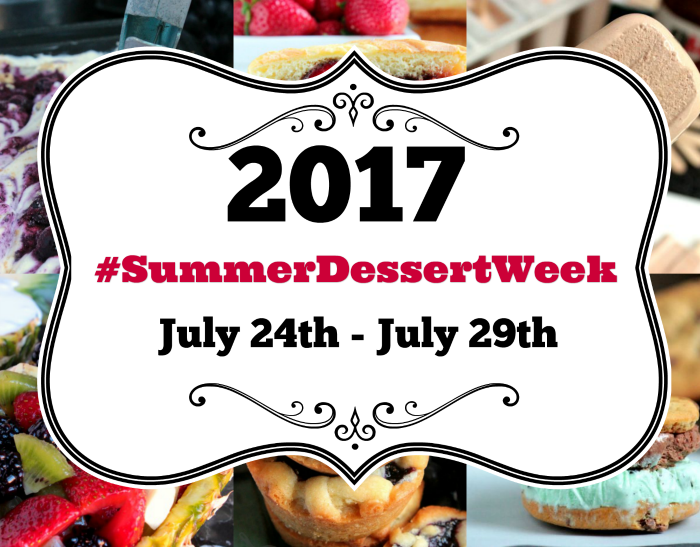 Today is the first day of #SummerDessertWeek! This sweet event is hosted by Angie from Big Bear’s Wife. We’re so glad you’re joining us, for this week long event of desserts and giveaways. There are 25 amazing bloggers participating in this year’s event! Throughout the week, we’ll be sharing tons of fantastic summer dessert recipes with you. With over 70 recipes being shared this week, we just know that you’re going to find a new summer favorite! Plus, don’t forget that we have 6 (six) great giveaways for you this week, thanks to our amazing sponsors! In a medium bowl combine the peanut butter, and sweetened condensed milk until smooth. (set aside). In the bowl of a stand mixer, whip the heavy cream, powdered sugar, and vanilla on high speed until stiff peaks form. (Don't over-beat or you'll wind up with butter)! Fold the whipped cream into the peanut butter mixture until combined. Gently stir in the cereal and most of the chopped peanut butter cups. (reserve a few to sprinkle on top). Spoon mixture into a 8x8 pan, and smooth top. Sprinkle the reserved candy pieces on top of the ice cream, and cover with plastic wrap. Freeze for at least 2 hours or until frozen. Cooks Note: Chilling the mixing bowl and beaters in the freezer before-hand, will help with the whipping process of the cream. Prize #1 -- Dixie Crystals is giving one winner a $100 Willimas Sonoma Gift Card OR a $100 Sur la Table! Winner of prize #1 gets to pick which gift card they would like! Prize #2 -- Rainier Fruit is giving one winner a Pie dish, Cherry Pitter, Serving Spatula, Pinch Bowls, Pie Carrier! Everything you need to make the perfect cherry or blueberry pie! Prize #3-- OXO is giving one winner an 8 Piece Glass Bake, Serve & Store Set. OXO Glass Bakeware is made of thermal shock resistant borosilicate glass, which means it can go from freezer to oven without the need to thaw. The OXO 8 Piece Glass Bake, Serve & Store Set is the perfect partner for all of your baking adventures. The Set includes a Glass 3 Qt Baking Dish, Glass 2 Qt Baking Dish, Glass Loaf Pan, Glass Pie Plate, 1 Cup Round SNAP Container, and 2 Cup Round SNAP Container. Prize #4 -- Adam’s Extract is giving one winner a Pyrex with baking utensils and 4oz Adams Best, 1.5 oz Pure Lemon, Almond, Peppermint and Vanilla. Prize #5 -- General Mills Cereal is giving one winner 4 boxes of cereal, 2 Big G Cereal character bowls, 2 Big G Cereal character , 2 “Good Morning” spoons, 2 Cheerios tumblers with straws 1 long-sleeve Cereal Character hooded t-shirt, 1 short-sleeve Cereal Character t-shirt. Prize #6 -- Land O’Lakes is giving one winner a branded insulated tote with a stainless steel water bottle, two mugs with cocoa mix, a dish towel and coasters. Giveaway open to US Residents 18 years or older.. All entries will be verified. No PO Boxes Please. Prizes will be sent directly from sponsors to winners, bloggers are not responsible for prizes. This giveaway runs from July 24th until July 30th at 12AMEST. Winners will be selected soon afterwards and contacted by e-mail. Winners will have 48 hours to respond or a new winner will be chosen. There are a total of 6 (six) prizes and therefore we will have a total of 6 (six) winners. No purchase necessary. Void where prohibited by law. Disclaimer: These posts and recipes are part of the week long event, #SummerDessertWeek but all opinions are 100% mine! We would like Thank our amazing sponsors: Dixie Crystals, Rainier Fruit, OXO, Adam's Extract, Land O'Lakes and General Mills Cereal! These wonderful sponsors provided the prize packs for our giveaways and also sent samples and products to the #SummerDessertWeek bloggers to use in their recipes. Follow #SummerDessertWeek on social media to keep up with us too! Did you make this recipe? I'd love to hear what you thought of it. Or snap a picture and share it on social media with the hashtag #homesteadrecipes. I'd love to share your creation too! You can never go wrong with peanut butter, chocolate and ice cream. Very nice recipe! Agreed Renee. I have four food weaknesses, the three you mentioned, and cheesecake. :) My diet goes right out the window. What a dreamy ice cream flavor!!! I'd love a big bowl after dinner tonight! It is so good Liz, my husband has asked me several times when I'm going to make more. Oh yummy! Definitely going to try this!! Hope you enjoy it as much as my family did Dana! Thank goodness I too got this cereal and have some leftover because I need this! It is so good Erin! I loved how the cereal became chewy little bits of yumminess in the ice cream. No churn ice creams are my favorite! I can't wait to make this for Thomas, he loves peanutbutter! I'm a huge peanut butter fan to, especially if it's paired with chocolate! I keep seeing all these no churn ice cream recipes. I am going to have to make this. I am a huge peanut butter fan. I hope you get to try it soon Jennifer, no churn ice cream is so easy and good! I am new to your blog. AND I LOVE IT !.!.! Enjoyed visiting all the other blogs too. I know a few friends that will love this! Oh yes I'm sure the hardest is waiting, right? What a delicious sweet treat!!! Oh boy is it hard to wait Debra! At the 2 hour mark it's a soft-serve consistency. If you can wait about 8 hours, or overnight, it's more like ice cream from the store. I want to make all the no churn ice creams I see. This one looks especially tasty! 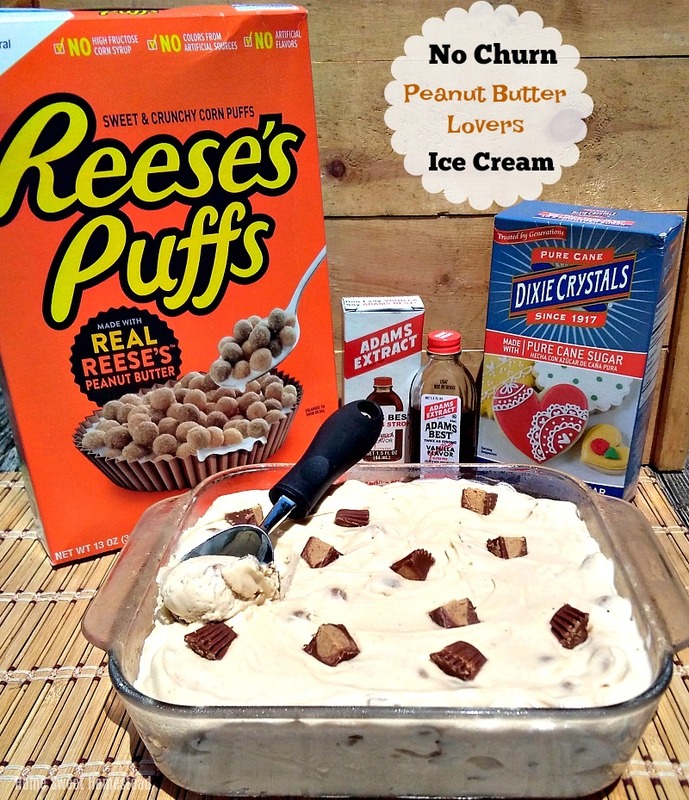 If you like peanut butter, you'll love this flavor combo! Yum! Peanut butter is one of my favorite ice cream flavors. Mine too, especially when it's paired with chocolate! 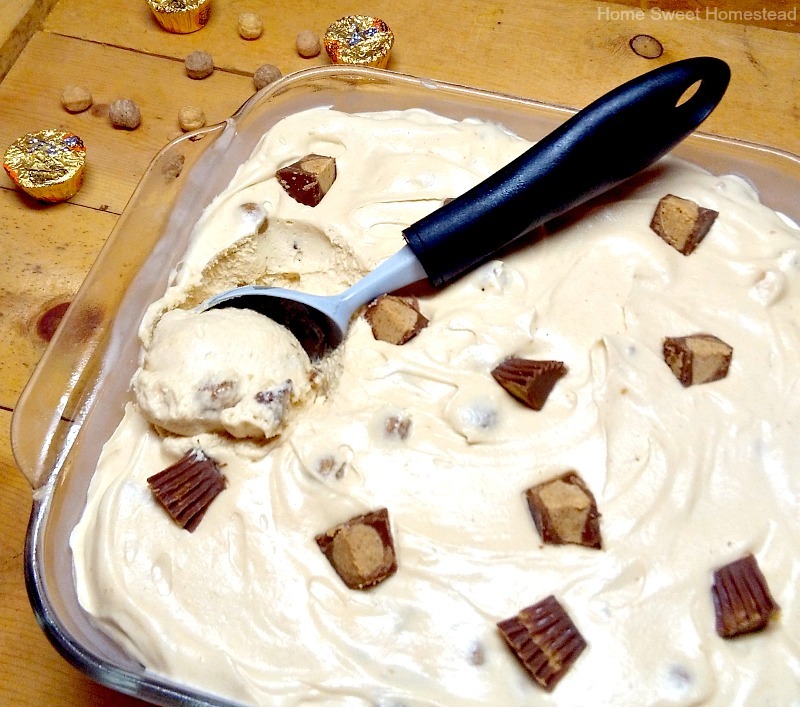 Peanut butter ice cream is one of my favorites! Looks great! Thank you so much for taking the time to read and comment. I love reading your thoughts and ideas. 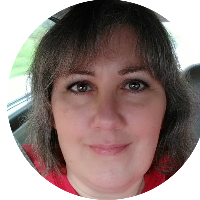 I'm a Hoosier wife, empty nest mom and mamaw, who enjoys cooking for her family. When I'm not trying new recipes or whipping up family favorites, you'll find me reading my Bible, or discovering new adventures with my husband as we travel in our RV. 25 Instant Pot Recipes and a Giveaway! ©April Tuell & Home Sweet Homestead 2010-2019. All rights reserved. April Tuell/Homesweethomesteadx.com is a participant in the Amazon Services LLC Associates Program, an affiliate advertising program designed to provide a means for sites to earn advertising fees by advertising and linking to Amazon.com.